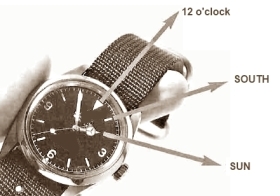 Finding direction is easy using your analog watch. Hold your watch horizontal and point the hour hand at the sun. Note the direction of 12 o'clock mark. The direction that lies exactly midway between the hour hand and 12 o'clock mark will be South. To ensure the direction will be accurate, you need to set your watch to the actual local time, without any changes for daylight savings time. The further away you are from the equator, the more accurate is the direction. By the way, the majority of human population (about 90%) live in the Northern Hemisphere, which contains most of Earth's land area. Hold your watch horizontal and point the 12 o'clock mark toward the sun. Note the direction of the hour hand. The direction that lies exactly midway between the 12 o'clock mark and the hour hand will be North. You should understand, of course, that finding direction using your watch and the sun gives you the correct general direction. You would still need a good compass for navigation if you want very accurate and highly precise directional information.